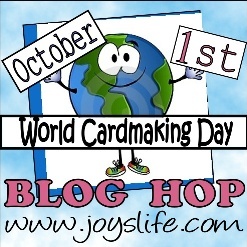 Simply Silhouette: World Cardmaking Day! connection that they create between friends and family. them in their card making. That little witch made me smile. : ) great card! And, I love that you decorated the inside! Awesome card!! I am a super huge Bugaboo Stamp fan and just LOVE this image and the sentiment from Joy's Life! I am already a follower and I just love your work. Great job on that wart!!! LOL!! TFS. posted your blinkie on my blog.and already follow you on FB. TFS! Very cute, ties in perfectly. What a cute card. I love digi stamp..
Love that sentiment, such a cute card! Warts Up! hahaha I love it, your little witch is so cute. I just became a follower to, looks through your blog and love what I see. Cute card, I especially love the sentiment! LOL! Absolutely adorable! Just love how you did the inside! Warts up???!!!! Had me laughing out loud. CUTE creativity!! OH, sooooo cute. I love Joy's sentiment, she's such a punster. I'm hopping over to Bugaboo to see their digis!!! I love the way you colored the cute witch. Warts up! LOL, that really had me laughing! It just says it all. Love the card....so cute. Thanks for the chance to win the blog candy. OMG!!!! LOVE THIS CARD!!!! SUPER CUTE!!! 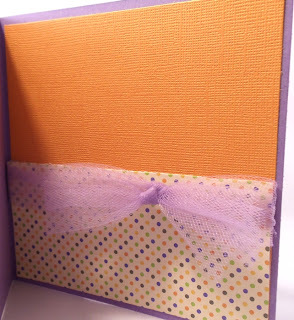 Adorable card, i love the sentiment, it is perfect for the card! 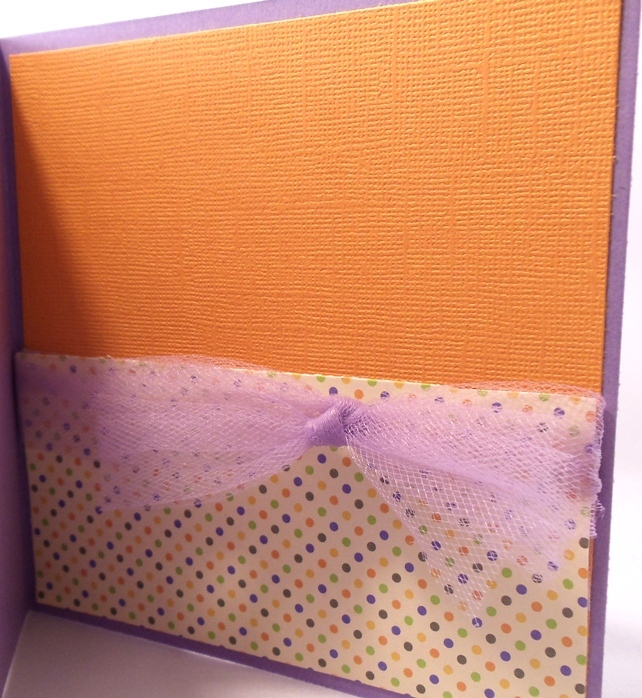 Cute card; like your choice of paper, netting for the bow, and the great saying. Your card is so cute! 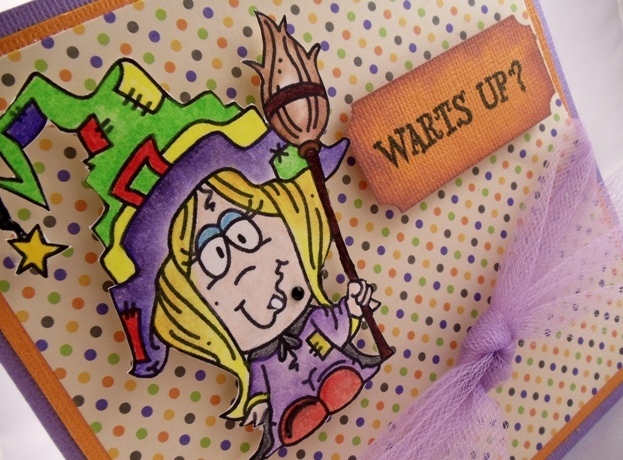 Halloween is my favorite holiday so I love sending cards to freinds and family!! Thanks for a chance to win!! What a punny card! 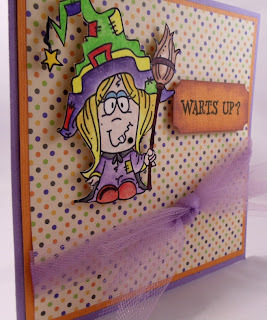 Just adorable!--Pat N.
Oh Julie, your card is Wickedly cute.. 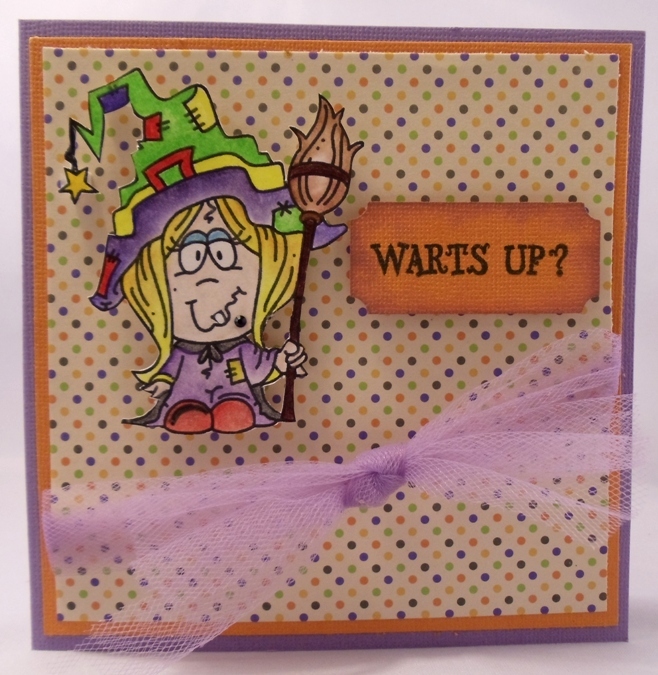 I love the witch image you used and the sentiment you used is prefect.. It was so nice to be in this hop with you..
Love your card! Such a cute image! 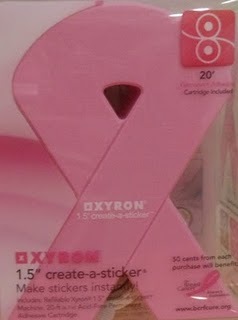 someday i toowill be able to make such cute cards with my circut!!! your card is sooooo cute. Hope I'm not too late, either way...Super Cute! Love the card!! Would love the chance to win!